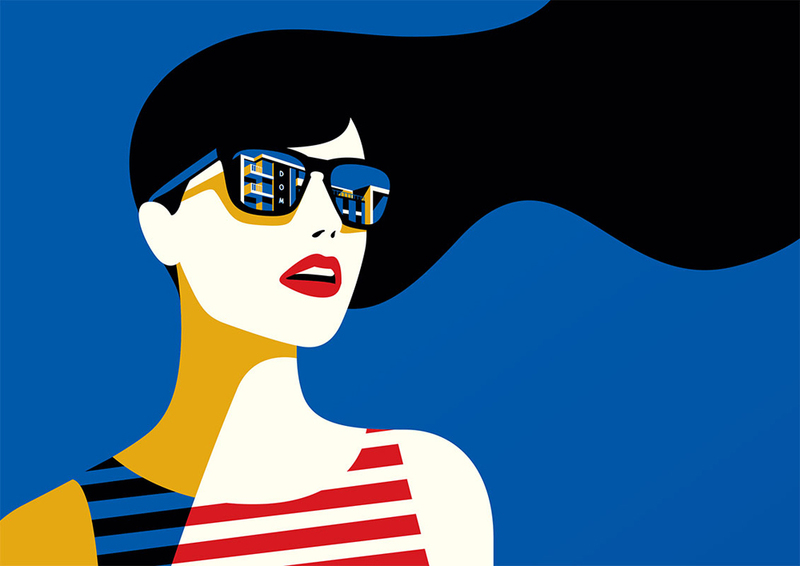 Born in Paris, Malika Favre has been living in London for over a decade. Having worked for the illustrious Airside design studio until 2011, she is today one of Britain’s most sought-after graphic artists and illustrators. 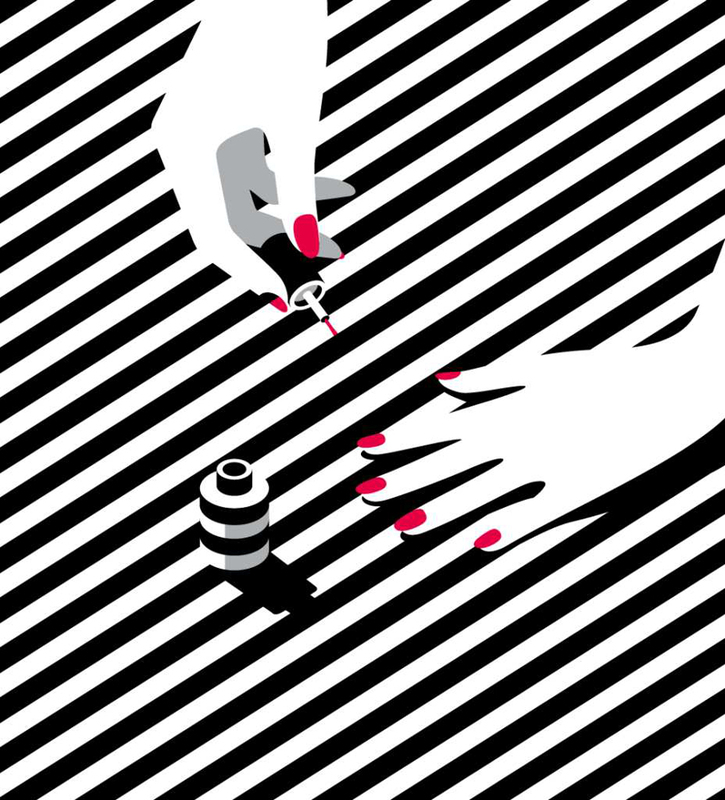 Her distinct, minimal style has been described as “Pop Art meets OpArt” and clearly betrays a love for the classy 50s, Paris and graphic novels. Malika’s clients include The New Yorker, Vogue, BAFTA, Gucci and Penguin Books. Malika talkED to Plastik about the art of illustrating, her career and inspirations, London vs. Paris, and much more. Malika means ‘queen’ in Arabic. Do you have Arabic roots? Or did your parents just like the name? My mum is from Algeria but was born in France. Both my parents loved that name and had very high expectations as you can see. I used to hate that name as a kid, but grew to love it. Ever since you were a child, you loved drawing. What were your favorite children books, stories or cartoons? I don’t remember my children books much, apart from The Little Prince of course, which my parents read to me hundreds of times. But what I remember most is the graphic novels I used to read. My favorites were Blake and Mortimer, Tintin and XIII. I always loved graphic novels, mainly for the story. I didn’t really care about the quality of the drawings, as long as there was a great storyline – which is funny thinking about it now. I still absolutely love Riad Sattouf [author of L’Arabe du Futur] and Joann Sfar [who did a graphic novelization of The Little Prince] for their wit and dialogues. You studied graphic design. Why? Why not, say, fine arts? In 2006, you joined the influential London-based Airside studio. What made them so unique, special and, eventually, successful? I remember the day I discovered Airside’s work in Le Book. Their aesthetics were so bold, playful and colorful. I was really amazed by the idea that a studio could produce such fun work. When I joined them for a three month internship, I quickly learnt it was a very special place. They operated like a family, gave their designers a lot of freedom and support, and really had a strong ethos about where they wanted to be within the industry. There was hardly any hierarchy. Basically anyone could decide on how much responsibility they were comfortable with. Airside definitely shaped me into who I am today and all designers carried the studio’s ethos to wherever they went after the studio closed. One of the most important things for Airside was to produce joyful and intelligent work while working with nice people. How important was Airside for your career? Airside was a crucial part in my personal development. Without them I wouldn’t be the illustrator I am today. I came in as a designer and left with my own voice. I will always be really grateful for that. Classy, the 50s, Paris, New York, Vogue and Audrey Hepburn are some of the words that come to mind when seeing your images. Does that ring a bell? All of them ring a bell, of course. Paris is my home and influenced me a lot. I am often told that my work is very French, whatever that means. More than specific times or places, I am inspired by beauty, wether it relates to fashion, objects, films or stories. I crave beauty and really feed on it on a day to day basis. In 2015, you were asked to make illustrations for the five main films nominated for the BAFTA awards. How do you approach such a huge assignment? 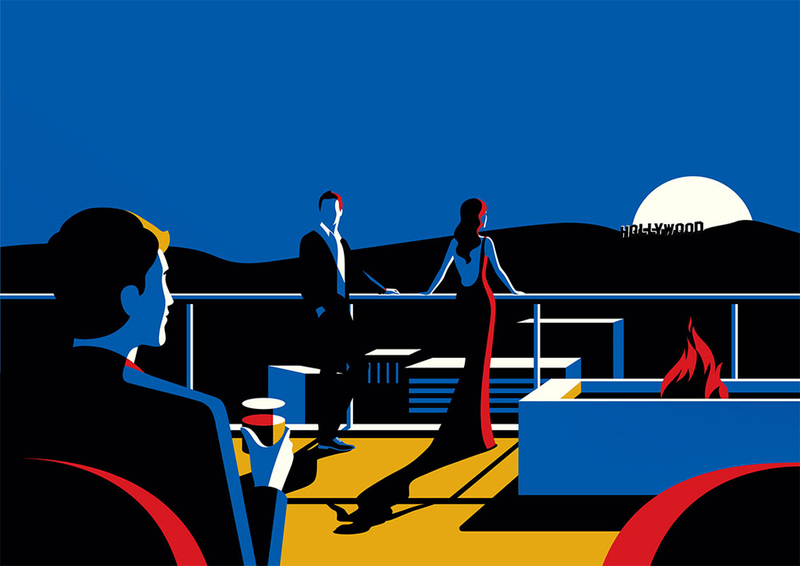 Creating illustrations for BAFTA (British Academy of Film and Television Arts) was my favorite project last year. I still remember getting Paul’s email from Human After All [creative agency] and feeling so excited about the prospects of that job. I knew I was in good hands with Paul as a creative director, having worked with him before at Little White Lies magazine. I knew it would be a real collaborative process. We approached it as a team actually, feeding of each other’s ideas and inspirations. They had a strong narrative concept (the big reveal), which was enough to get me started but also allowed me to really think about an overarching concept for the visuals. That project was really intense, as you can imagine, given the nominations were being announced very close to the actual deadline. But I knew that if the concept was strong enough, the rest would hopefully follow. And it did. I love the outcome of that project and feel really flattered it got nominated for both the World Illustration Awards and the YCN Professional Awards. I agree 100%. A great illustration has to have a strong narrative core. We are first and foremost storytellers. Simplicity is an aesthetic like any other, so I don’t feel that is always the case. That being said, I strongly believe in less is more and my personal taste definitely leans towards that statement. However, when you look at Thibaud Herem’s work, for example, simplicity is the last thing that comes to mind, and I love it! Agreed. An illustration could develop into pretty much anything depending on the choices you make. What would be your next dream job as an illustrator? Doing a Carré for Hermes or a cover for Marvel Comics. If you weren’t an illustrator what would you have liked to be? You’re a Parisian living in London. What three things should Parisians really know about London, and vice versa? London essentials: scones with clotted cream, barbecues in Victoria Park on one of the few sunny days of the year and trying a Sunday roast in a cozy pub. Paris essentials: finding the perfect bakery for your morning baguette, Palais de Tokyo, people watching on a brasserie terrace having an aperitif. Finally, what advice would you give a young aspiring girl or boy who loves drawing and dreams of becoming an illustrator? A successful career is 10% talent. The rest is work, people skills, business sense and optimism.